Tom King's run on this title has paused for this month, and a crossover with THE FLASH will cover his break from the book. I'm not sure why he's taking the break, but I'm sure he's overworked since he's working on a lot of books and projects. I don't blame King for any of this. It's a shame that other writers have to pick up the slack, though. I like Joshua Williamson and he did good work on THE BUTTON from a couple of years ago. He has a visible love and understanding of the DC Universe and it truly does shine through in this issue. His depiction of the characters is a more fun and vibrant one than what we're seeing in JUSTICE LEAGUE, and I appreciated it. This is really where my positive feelings on this issue end, however. HEROES IN CRISIS is really sending out this terrible ripple effect throughout the DCU and it genuinely annoys me. I wish that the event could remain in the periphery but the fact that it's shoving itself into my field of vision bothers me. The fact that Williamson has to justify King's story in a way to provide a thrust for this little side narrative generally cheapens the entire production. In addition to this, the story connects to King's overall run on this title, so this reads to me as a way to give King less to deal with when he returns to the title. Gotham Girl shows up in this issue, which has already been advertised so it isn't much of a spoiler. 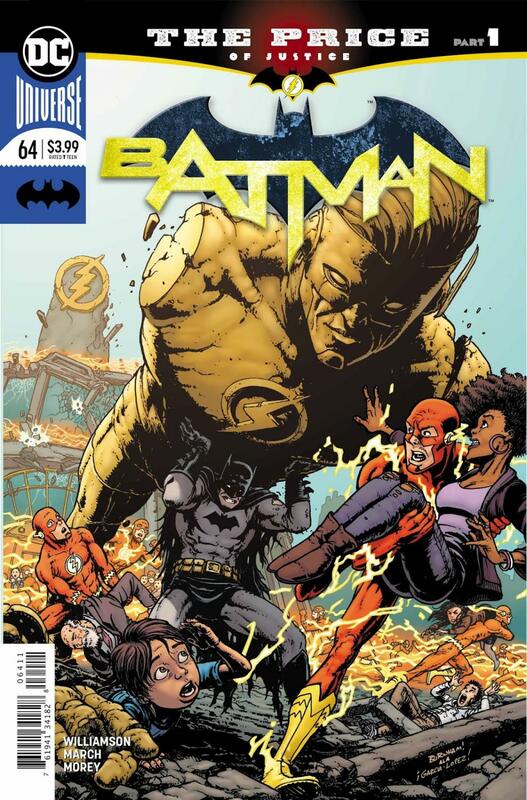 Gotham Girl appeared in BATMAN #50 from last July, so there was at least some indication that she would play a major role in the run going forward. If she's dealt with in this crossover, then what was the point of all that? Guillem March is doing some good work here, though I think he's either trying to channel Clay Mann, or was told to do so. March usually lets loose and has some wild visuals, but I think this was emulating the tone and visual aesthetic of HEROES IN CRISIS. The way March depicts Batman is very reminiscent of Mann's take on the character. Other than that, this was very strong artwork and I'm excited to see more.